As a congregation, we look for ways to spread the Word of God to others and to help those in need. While we have a long history of supporting various missions, we started at the end of 2011 to coordinate this effort in an attempt to increase our effectiveness through the strength of our numbers. On this page you will find information about specific missions we support, and results of our concerted efforts for these missions. If you have a mission you would like to see us support, please contact us and let us know! Additional details of our efforts will be forthcoming, but we hope to combine our efforts as we did in 2012 and help out these great organizations in 2013. Until then, you may click on any of the names above to be taken to each organization's web site. Pictured here is Mary Dailey Brown, the niece of Les & Ginny DeCarlo as well as the President and founder of SowHope. SowHope is a non-profit organization that was founded in 2006 by Mary, who was looking for an opportunity to reach out to women in need around the globe to provide them with much-needed assistance. Help from SowHope takes several forms, but microloans, birthing center funding and literacy projects are three examples of ways in which they help to better the lives of women living in conditions most of us in the United States could not fathom. They are not providing hand-outs; conversely, they help these women by teaching them how to stand on their own two feet and care for themselves and their families. Be sure to check the bulletins from March to May for more examples of some of the great ways this organization is using the funds it receives. While on that topic, Guidestar shows that nearly 97% of funds received by SowHope go directly to program services, so there is no question this organization uses its resources efficiently. They are planning to help build a birthing center in the Congo at a projected cost of $2,400. We are hoping to pool our resources and fund this for them, potentially saving hundreds of lives each year. 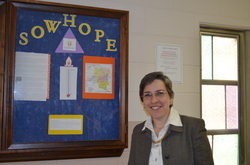 Update: A total of $1,551 was raised for SowHope, for which Mary Dailey Brown was incredibly grateful! Thanks to all who made that possible! Members of the congregation were asked to find creative ways to grow $10 ten-fold between July and October, 2012 through Mission India's Multiplication Plan Project. The "seed money" was distributed on July 15th and July 22nd. For more information about Mission India, please click here to visit their website. This extremely successful fundraiser generated more than $5,400 for Mission India thanks to the overwhelming generosity of our members! Amazing job to all involved! In partnership with Good Shepherd Lutheran Church in Frankfort, we assisted in a community-wide effort to raise funds to help feed some of the more than 925 million people in the world who are chronically hungry. Feed My Starving Children (www.fmsc.org) is working to end hunger with the help of volunteers around the globe. 24 cents each, but to keep their costs down, they need volunteers. More than 25 members of our congretation volunteered to spend time packing meals at Good Shepherd Lutheran for this effort, where 116,640 meals were packed. Donations also poured in from members of Trinity in the total amount of $1,669.87. Our donations added to the rest of what was raised for a grand total of more than $25,660, enough to cover 100% of the cost of these meals. Thanks very much to all who were involved - this was an incredibly rewarding experience! We serve this mission in a number of ways, from serving meals every other Monday to our annual giving tree program where we purchase Christmas gifts for needy families. In December 2011, we conducted our inaugurual "Mugs for Morningstar" campaign. The idea was simple - bring in your extra coffee mugs for the mission and ideally fill them up with loose change. This netted 204 mugs and over $800 in change! We also provided nearly $500 worth of Christmas gifts for them and another $800 in envelope receipts. When all was said and done, we delivered a check to them in the amount of $1,419.16 from Trinity. Click here to read about our visit to deliver their check to them - it was a moving experience to say the least!